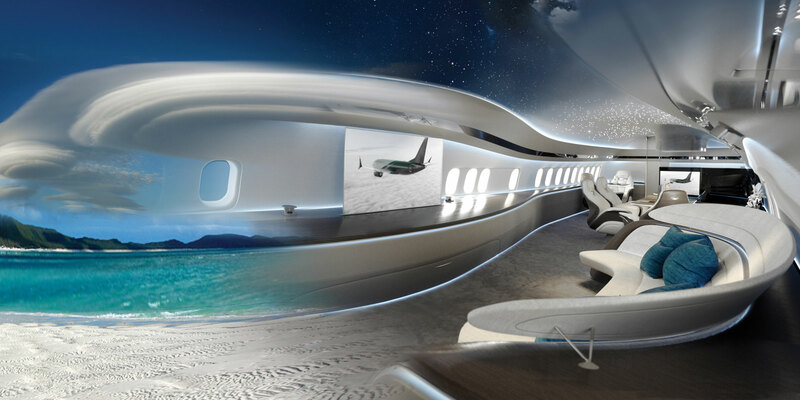 Boeing’s Genesis concept cabin design was developed by Argentina’s SkyStyle, and it highlights nature’s tranquility with carpeting that resembles a white-sand beach, puffy clouds, rolling hills, and a starry night sky drawn on the ceiling with tiny LED lights. Boeing Business Jets arrives at MEBAA 2018 fresh from the October delivery of the first BBJ Max—a Max 8—signaling the passing of the airframe’s torch to a new generation of Boeing narrow-body bizliners. "We are excited to begin delivering a longer-range and more capable version of the world's most popular business jetliner," said Greg Laxton, head of Boeing Business Jets (Chalet A9/A10), noting the “great market interest and anticipation for the BBJ Max." The BBJ Max family—based on Boeing's 737 Max airliner—delivers 14 percent improved fuel efficiency (and a 40 percent reduction in noise footprint), thanks to its CFM International Leap-1B engines and improved aerodynamics, which include advanced split-tip winglets and fly-by-wire spoilers. Maxs also feature 787-style large flight deck displays, a 6,500-foot cabin altitude, and thoughtful touches like built-in airstairs for independent field operations. To commemorate the first delivery, Boeing Business Jets has unveiled a new interior concept by aviation design firm SkyStyle, named Genesis. "BBJ Max interiors have always been a sharp departure from the cramped cabins of smaller business jets, and the Genesis design is yet another example of our exclusive cabin capabilities," said Laxton. Though developed for the BBJ Max 7, the sleek, curvy Genesis cabin can be adapted for the larger Max 8 and Max 9, which will precede the Max 7’s anticipated 2021 entry into service. The Genesis concept draws inspiration from nature's tranquility, such as voluminous clouds hanging over a white sand beach, smooth rolling hills, and a starry night sky, suggested in the cabin by the light color palette and ceiling studded with tiny LEDs. Pushbutton controls command a descending wine rack, bulkhead doors, and a table that quickly switches from an office to dinner-is-served dining mode. The inaugural Max, after installation of the standard auxiliary tanks at Aloft AeroArchitects, is having its VIP completion done by Comlux Completion in the U.S., Switzerland-based Comlux’s purpose-built VIP airliner completion center. The Max 8’s interior was designed by Peter Marino Architects of New York. Prior to MEBAA, Boeing had announced 20 BBJ Max orders, the most recent, for a Max 7, inked in July at the Farnborough International Airshow. A first BBJ Max 9 was ordered by an undisclosed European customer at the Paris Airshow last year and is scheduled for delivery in 2019. In addition to the Max family, Boeing Business Jets offers VIP versions of Boeing's wide-body 787 Dreamliner, 777, and 747-8. Since its launch in 1996, Boeing Business Jets has delivered 234 jets out of 260 orders.